The first Grand Slam of the year 2013 comes to an end with the final of the men's singles event between world no.1 and the defending champion Novak Djokovic from Serbia and world no.3 Andy Murray of Great Britain. 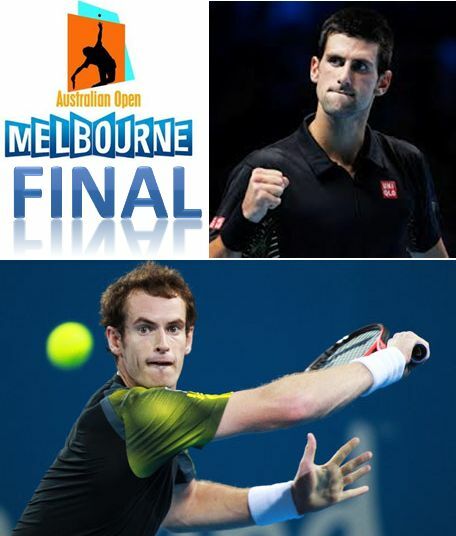 The final will be played Sunday, 27 January at the Rod Laver Arena. Djokovic won the 2012 Australian Open title beating Spaniard Rafael Nadal 5–7, 6–4, 6–2, 6–7(5–7), 7–5 in the longest Grand Slam final in the Open era, successfully defending his 2011 title. The 2012 title is the third Australian Open victory for Djokovic. For the Olympic and US Open champion Andy Murray, this is his first final of the Australian Open and would like to make his presence felt here as he did in the Olympics and rid his country of a long spell of 74 years of the Grand Slam like title. Murray overpowered world no.2 Roger Federer in the semis 6-4 6-7(5) 6-3 6-7(2) 6-2. Murray and Djokovic are of the same age, hence there is no 'aging' problem here as was against Federer who is now 31. Sunday's encounter between the two will be their 8th since they first met at Madrid in 2006. Of the previous 17 encounters, Djokovic has a winning edge of 10-7 over Murray. Murray beat Djokovic in his first Grand Slam victory at the US Open 2012, while Djokovic beat Murray at ATP London in the round Robbin phase. Both Murray and Djokovic are in their best form - however Djokovic lost one of his last ten matches against Tomic at Hopman Cup, Murray has won all of his ten matches. For tomorrow, Djokovic is defending his title for the fourth time and two titles in a row, while Murray is playing his first Australian Open final. It will be interesting to watch tomorrow's finals and see whether Murray is able to clinch the title from Djokovic or the Serbian wins it for the fourth time. The match is scheduled at 09:30 GMT Sunday, 27 January at Rod Laver Arena.